You don't have to make your own Christmas ornaments, but you can, and the beauty of the Gingerbread and gingham theme is that you can mix the two. No time for crafts? Plenty of gingerbread theme decorations are around because they are just so cute. Buy some! Here are loads of incredibly cute Gingerbread decoration suggestions. 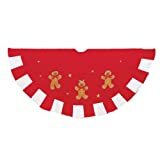 The warm brown of the cookies looks wonderful when harmoniously set off by red and white; and that homey combination is found in the cheerful Gingham check material of many ribbons. The beautiful thing about Gingham ribbon is the way its checks come in many colors and goes with natural elements like burlap and sisal twine. Blue and White, Green and Cream, are two other classic combinations to use. 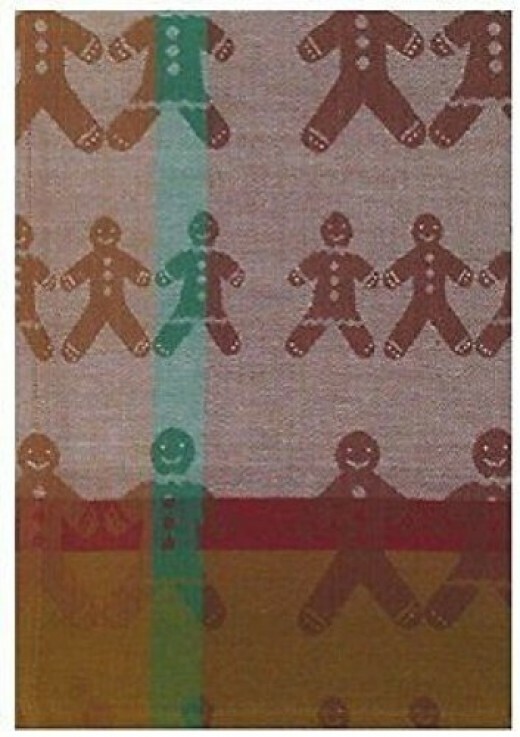 Whatever type of Gingham check you find, that is the color theme you can use, and the cheerful Gingerbread men will happily pair up with any and all of them. It looks pretty and traditional with the red and white peppermint canes and the red,green and white colors of the holiday. It is a very old fashioned and well loved look to use for your Christmas celebration. A tree designed in this theme can be very simple, but it can also be done up in lots of glitz if gold is added to the mix. The intricate white icing designs are also very detailed and sophisticated if that is the look you wish to see. For me, I like the simple and cozy look of the Gingerbread, peppermint, and gingham be-ribboned tree. 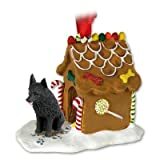 Cute little black dog is in the doghouse again... but this time it is a gingerbread one. Get a serious recipe book. 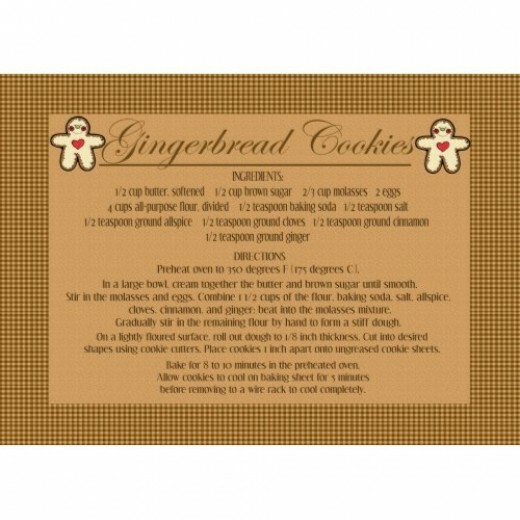 I like this one shown on the right because it has so many varied ways to make great gingerbread flavored creations. Assemble all your ingredients and utensils. The Gingerbread Man measuring spoons will help. or wait... it is all made for you! Gingerbread is available everywhere for Christmas and professional bakers in Europe provide intricately decorated cookies that look too pretty to eat. If you have the patience, you could make your own, but if not, there are some really gorgeous ones available online. In Hungary, they are traditional. Choose to bake your own gingerbread cakes and cookies. Or buy them! You can even order gingerbread from an online source to have a delicious supply of the real thing. Gingerbread has had a long history and in the timeline it has had a number of variations, as you might well imagine. That is why it can have different flavors and textures depending on the locale ... or time in which you choose to base the recipe. For some, it is a flattened and crisp cookie. That is the recipe I use when I bake my Moravian Spice Cookies. It can be a cake, like my Maple Cream dolloped Gingerbread bundt cake, or it can be closer to the "bread" type of recipe, such as a date-nut or banana bread. 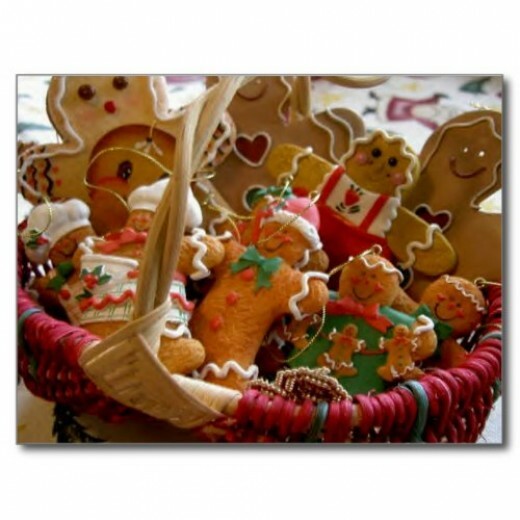 It is believed that gingerbread was made as far back as the ancient Greeks and the Egyptians. Thought to have traveled to Medieval Europe with returning Crusaders, as many new flavors and trade goods did, Gingerbread was a treat widespread among these societies during festive times, such as holidays and fairs. German Lebkuchen are the forbears of the cookie we now call gingerbread. The Baker in you will be pleased with a way to wear festive gingerbread cookie cutter jewelry this Christmas. They've certainly been around for a long time, and you are bound to find plenty of vintage Christmas ornaments and kistch to create your own version of a Holiday Bakeshop. From Your Kitchen: Eat Me! Cookie recipes often seem so long and complicated, but they aren't! Not only are they simple rolled cookies, but they are great "keepers", if you can keep the cookie tasters at bay. In a large bowl (KitchenAid's great for this) beat butter, brown sugar, and egg on medium speed until well blended. 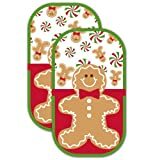 Cut out cookies with desired cutter-- the gingerbread man is our favorite of course. Bake 1 sheet at a time for 7-10 minutes . After cookies are cool, decorate as you wish. Brush them with a powdered sugar glaze or decorate with Royal icing. 1. Place all ingredients in a large mixing bowl and combine. Scrape down sides. Turn the mixer to high and beat until thick and very white. Mixture will hold a peak. This should take at least 7-10 minutes. 2. When finished, cover with plastic wrap, making sure it touches the royal icing so a crust doesn't form. Royal icing dries out quickly, so make sure it is covered all the time. Otherwise there will be lumps in the icing and they will never pass through an icing tip. 3. I prefer white icing, but you may tint it by using a small amount of paste food color. For 1/4 cup tinted icing, dip the tip of a toothpick into desired color, then into the icing, and stir well. Repeat until desired color is achieved. For strong colors, such as red, royal blue and dark purple, use 1/8 teaspoon color to 1/4 cup icing. 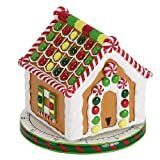 Take it from a pro- a gingerbread dough that will stand up to the use as decorative features, cookie houses, and ornaments. 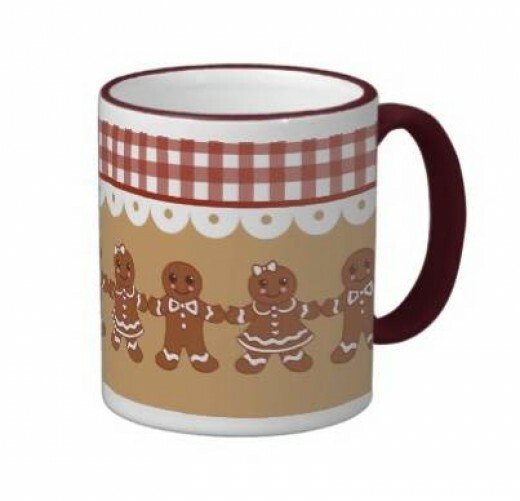 Cute Zazzle Gifts - Who knew there were so many ways to add to your decor? The mugs are just the right touch for some spiced mocha or hot chocolate with tiny marshmallows. The serveware is dolled up enough that when emptied of the goodies ( like appetizers, snacks or whatever) it is still giving a holiday message to the table. The kitchen is one of the most natural areas to use this cute theme. Hang some homemade cookies from a spindle tree on the counter ( those pretty wooden tree form racks that the Swedish use for just this décor idea. The oven mitts and tea towels are always inexpensive and useful ways to add to the Christmas spirit, no matter which motif you use during th eholidays. 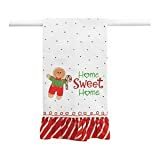 One of the things i so like about this one is its appeal to children, and the way it mixes so well with candycane swirls, hearts and those gingham bows. It can be a sweet as a candy theme or more of a natural burlap and pine look. When you are finished decorating the tree, add this well designed tree skirt to continue your theme. It is great with red,green, and white theme, or a natural theme with pine cones and the colors of nature-related decorations. Christmas Craft List - Because you want more cute stuff! Cork Gingerbread Ornament Craft for Christmas.